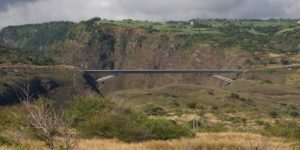 Grande Ravine Bridge is one of four exceptional structures on the Route des Tamarins, the road linking the towns of Saint-Paul and L’Etang Salé. In 2002, the SETEC-SPIELMANN consortium won its bid to supervise the design and construction of this spectacular viaduct (spanning a ravine 320 m wide and 170m deep). The abutment foundations include a 10 m diameter shaft embedded into the mountain over a height of 20 m and connected to a counterweight abutment. The earthworks for the abutments and shafts took place between August 2006 and June 2007, with the final junction made on October 28, 2008. This foundation system, which was validated using 3D finite element calculations, enabled the abutments to move less than 1 cm during the positioning of the deck. Full design and construction supervision for this spectacular structure (320 m wide and 170 deep ravine).